Project KickStart v6.2 Has Arrived! Plans can be complex, but the planning process shouldn't be. This has been our philiosphy through six versions of Project KickStart, and 40K+ customers seem to agree. In fact, we designed Project KickStart to guide people through the planning process like a coach - helping them identify goals, risks, phases, and collaborators, so that they can better build a comprehensive task list. 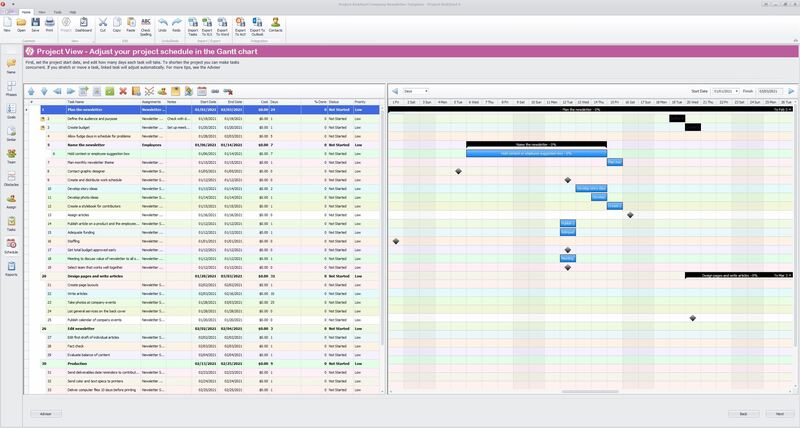 With the task list built, Project KickStart then generates a full Gantt schedule, including task dependencies, that helps get things done - on time and on budget, and for less than half the cost of the leading project management software. 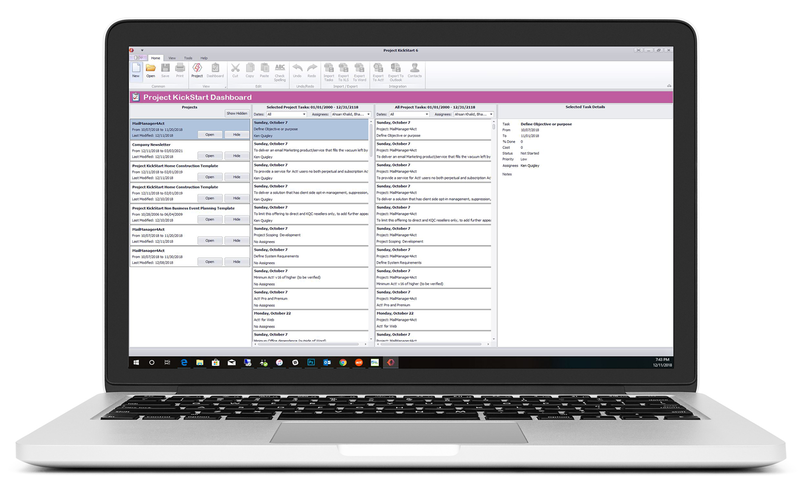 Create a project outline showing Phases, Tasks, SubTasks, Goals, Notes, and more. While not an exhaustive list of all the changes introduced with Project KickStart with versions 6 and 6.1, the following are some of the marque new features we think have made this release worth waiting for. We've introduced a new project dashboard that will change how you manage your projects. The new Dashboard, which can also be configured as your welcome page, provides a quick overview of ALL your projects so you can preview your upcoming tasks, regardless of which project they're part of. We've also allowed you to filter by project, date range, and assignee for easier task management, as well as a handy new "Timeline" column that aggregates all upcoming tasks from all projects. 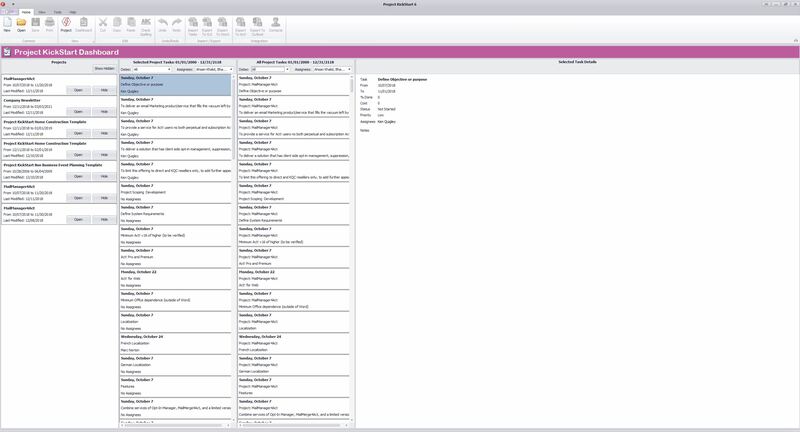 Once you build a project in Project KickStart, you can easily take it to the Cloud by importing that file into Webplanner.com, and collaborate with anyone, anywhere, and on any platform or device because they can work with each other's data files seamlessly. To help give your project wings, we've even included three months free Webplanner with each PKS purchase. Add "Upgrade Assurance" to Project KickStart, and each subscriber gets a free $60 Webplanner upgrade for even more savings. 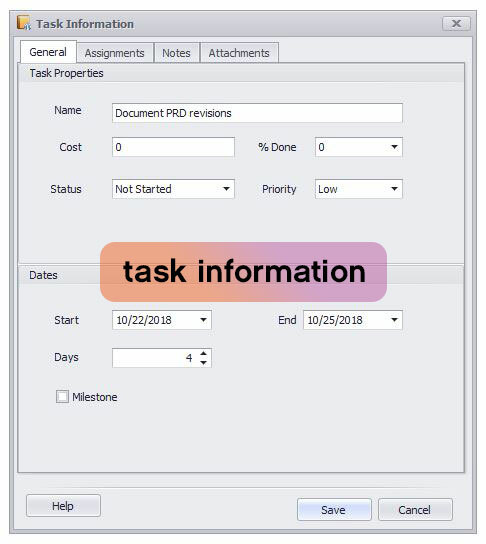 New to 6.2 is support for dragging and dropping tasks in the task list. A planning software should save you time and effort, and what better way to quickly organize your tasks than by dragging them where you need them, under whatever phase makes sense to you. And Project KickStart 6.2 quickly adjusts for phase costs and completion percentage based on these phase-to-phase moves. New to 6.2 are increased configurable settings that include two Projct Folders (one local and one network), both of which will display on your Dashboard. This allows users to see personal and team projects in one Dashboard. 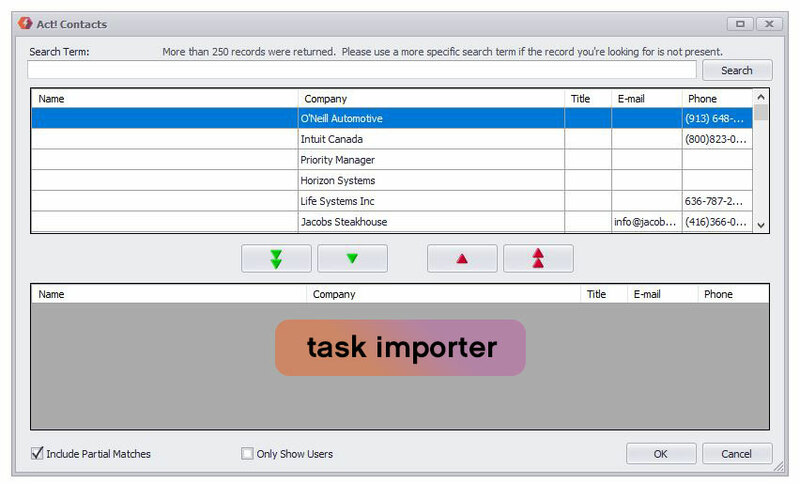 Task functionality has also been improved with a "Set Parent" option in Tasks to easily assign tasks to different phases. Editing a task no longer requires a refresh of the whol tasklist, which has significantly improved performance. The new comment logging feature within tasks was improved to be more intuitive and accountable. Previously it was a simple memo field that was edited manually each time, whereas now you click a button to add or edit a comment that is properly time/date/author stamped each time. This delivers better auditing with less effort. We've even given it it's own tab so you can preview more data with less scrolling. Protecting your projects has never been easier with our new Backup and Restore utility. You can now backup all your projects, including attachments, in one password protected step that safeguards your work. You can back up to an external device, or to a shared online storage resource like OneDrive or DropBox. And should you ever need to restore from backup, all the attachments are restored with the project, regardless of where they had previously been located. One of the primary objectives of Project KickStart has always been ease-of-use, and we've continued that tradition with this release. For PKS 6 we've revamped the user interface to give it a more contemporary look and feel, while implementing features like the Dashboard, Task Columns that auto-widen, and more intuitive Toolbars and Navbars. We've even built in options that allow the users to select different size toolbar icons based on visual comfort. We've expanded the preference options substantially from the last version. In addition to setting program font size and color, users can now can set default directories for projects, templates, exported files, and attachments, as well auto-linking tasks by default. You can also configure the preferences to open either in Project or Dashboard view, load the last project, and further select which section of the project will first be displayed - like "Tasks" for instance. By popular demand, we've also enhanced attachment management. 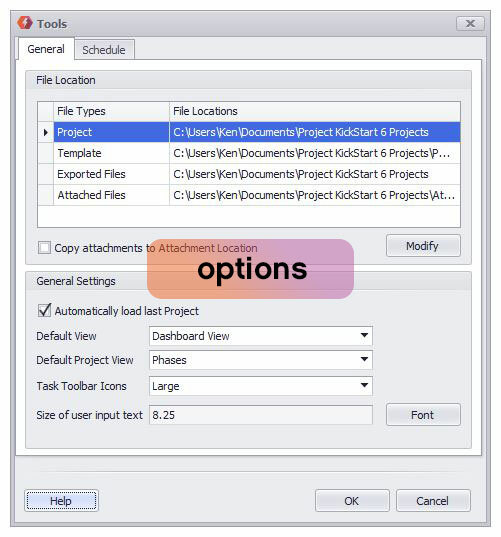 Project KickStart 6 has added flexibility in getting your contacts and resources into the application. The ability to import your coworkers, partners, or other resources from a comma separated value (CSV) means less time copy and pasting or inputting those resources manually and more time accomplishing your project goals. We've also added the ability to import contacts from Act! and Outlook, where most of your project contacts are likely to reside. Keep the project on track with basic budget and cost tracking. Then compare your estimates to actual budget spends and time consumption. 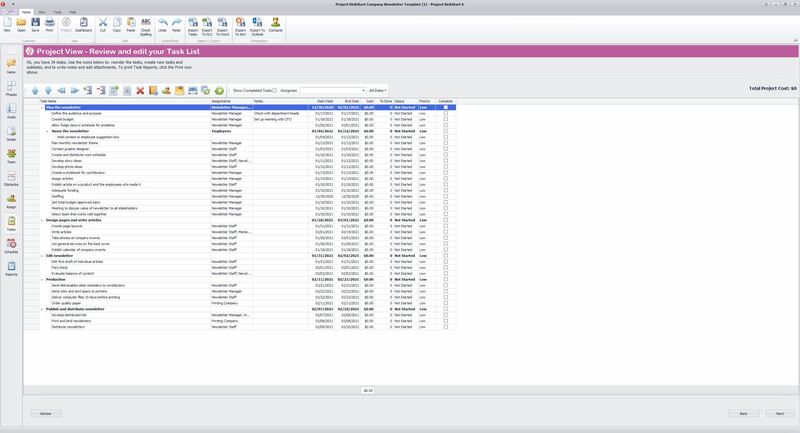 Project KickStart 6 even displays a running "Total Cost" calculator at the top of the Task List, and at the bottom of the cost column. Keep everyone notified about what and when things need to be done or any changes in schedule. Plan your activities in Project KickStart, and then "push" those tasks directly to Act! 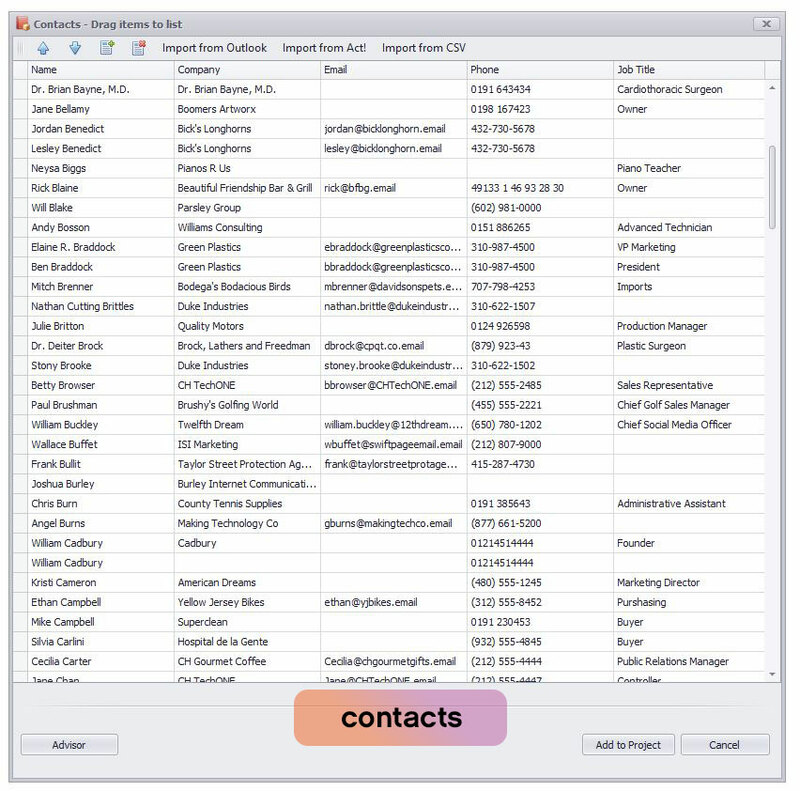 or Outlook, while choosing the contacts & users on the fly! 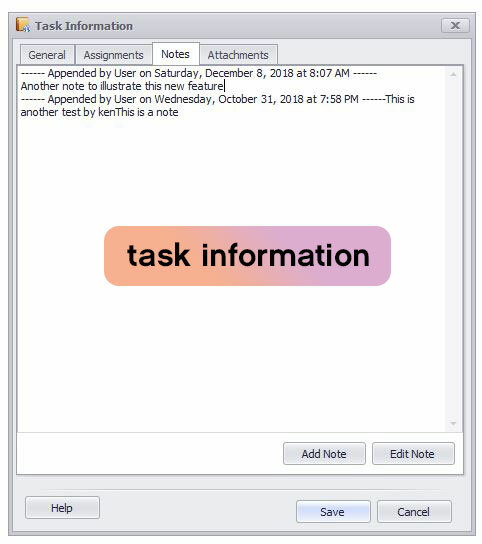 You can even link tasks to existing activities in Act!. New to Project KickStart v6 is our "Updater" utility that checks to see if you have the latest build, and updates your program in one simple step if a newer version is available. Since the October 23rd release of Project KickStart v6 we've added numerous features and fixes that are now easily detected and delivered with our Updater. The updater is useful for in-version updates only, and not full version upgrades (ie. from v6 to v7). 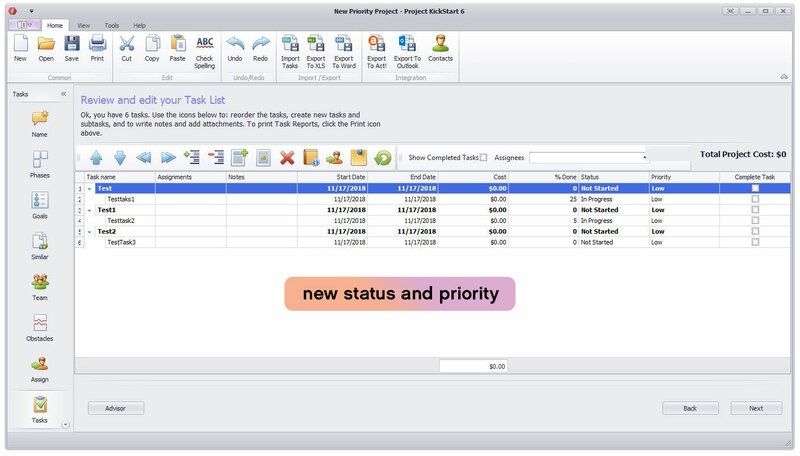 New to Project KickStart v6 is the enhanced task list, that allows you to clear a task with one click, and remove the completed item from view when done. We've also improved cost tracking, added the ability to hide/display task columns in list view, auto-fit column widths, as well as added dynamic "status" and "priority" for tasks. We've also added easier Task filtering by Assignee, Dates, and completed tasks to help you narrow your focus on what's important. New to Project KickStart v6 is the ability to import projects in Excel format. Whether you built the task list from scratch in Excel, or exported it from another application, Project KickStart v6 now supports importing that list directly into a new or existing project. Project KickStart v6 combines the features of the old Standard and Pro versions into one, and updates the programming to be compatible with your newer software. And with support for the latest version of Windows, Microsoft Office, and Act!, you can plan with confidence knowing that your projects will leverage today's technology, rather than be limited by it. Import Contacts and Users from Outlook and ACT! addressbooks. PKS v6 can open project files made by legacy PKS versions, but legacy versions cannot open PKS v6 files.